Meigs senior Wesley Smith (21) scrambles to recover a fumble during a Week 1 football contest against Gallia Academy at Memorial Field in Gallipolis, Ohio. Last Week: Miller lost to Belpre 36-19, in Belpre; Southern defeated Wahama 43-0, in Mason. Last meeting between the teams: Sept. 15, 2017. Miller won 22-0 in Hemlock. SHS offense last week: 108 rushing yards, 67 passing yards. SHS offensive leaders last week: QB Logan Drummer 3-of-4, 39 yards; RB Trey McNickle 2 carries, 45 yards, 2TDs; WR Gage Shuler 2 receptions, 44 yards. SHS defense last week: 69 rushing yards, 14 passing yards. 1. The Tornadoes have defeated Miller 5-of-6 meetings, with three of those six games ending in shut outs. Miller holds a 12-to-10 edge in the last 22 meetings, with the Falcons’ last trip to Racine resulting in a 41-0 Tornadoes victory. 2. Southern’s special teams unit has found the end zone in each of the first three weeks, with a kickoff return in Week 1, a punt return in Week 2, and a blocked punt return last Friday. The SHS defense has also scored twice, once on an interception return and once on a fumble return. 3. The Tornado offense has found paydirt 14 times this year, while gaining 281 yards per contest. The ground game is responsible for nine SHS touchdowns and 564 total yards through three weeks. 4. Southern cashes after the touchdown as well, as the Purple and Gold are 12-of-13 on point-after kicks, and 5-of-6 on two-point conversions. 5. The Tornadoes are trying for their third 4-0 start in the last six seasons. Southern’s current winning regular season streak is at five games, featuring just a dozen points by the opposition. Last Week: Meigs lost to Logan 45-35, in Rocksprings; Vinton County lost to Fairfield Union 28-0, in McArthur. Last meeting between the teams: Sept. 15, 2017. Meigs won 28-21 in Rocksprings. MHS offense last week: 124 rushing yards, 197 passing yards. VCHS offense last week: 44 total yards. MHS offensive leaders last week: QB Coulter Cleland 11-of-20, 175 yards, 3TDs, 1INT; RB Cole Adams 15 carries, 97 yards; WR Cole Adams 5 receptions, 112 yards, 2TDs. VCHS offensive leaders last week: RB Cade Sibner 11 carries, 27 yards. MHS defense last week: 196 rushing yards, 146 passing yards. VCHS defense last week: 411 total yards. 1. This is the start to the Tri-Valley Conference Ohio Division season for both teams. Meigs and Vinton County were both 3-3 in the league last season, putting the two teams in a three-way tie with Wellston for third. 2. The Vikings defended their home field the last time Meigs visited, with VCHS claiming a 41-29 win on Sept. 16, 2016. The Marauders last won in Vinton County was Sept. 19, 2014, by a 46-13 final. The all-time record between the teams sits at 18-16 in favor of the Vikings. 3. Through three weeks, the Marauder offense has found the end zone 11 times, nine of which have been passing scores. The MHS defense has also earned a touchdown this season, an interception return in Week 1. 4. Meigs has scored all-4 times its gone for the two-point conversion this season, with all-4 as pass plays. The Maroon and Gold are just 3-of-8 on point-after kicks. 5. 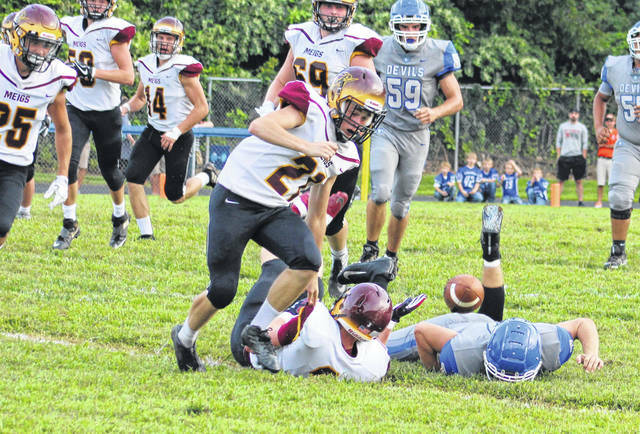 The Marauders have only been outscored by 11 points in the first three quarters of games this season, but Meigs’ opponents have won the fourth quarter by a combined 32-0 tally. Last Week: Eastern lost to Trimble 35-0, in Tuppers Plains; Waterford lost to Fort Frye 22-20, in Beverly. Last meeting between the teams: Sept. 29, 2017. Waterford won 35-8 in Tuppers Plains. EHS offense last week: 112 rushing yards, 21 passing yards. WHS offense last week: 133 rushing yards, 203 passing yards. EHS offensive leaders last week: QB Isaiah Fish 4-of-12, 21 yards, 1INT; RB Steve Fitzgerald 10 carries, 83 yards; WR Nate Durst 1 reception, 11 yards. WHS offensive leaders last week: QB Peyten Stephens 11-of-21, 191 yards, 1TD, 1INT; RB Braden Bellville, 24 carries, 119 yards, 1TD; WR Zane Heiss 4 receptions, 125 yards, 1TD. EHS defense last week: 207 rushing yards, 132 passing yards. WHS defense last week: 354 rushing yards, 49 passing yards. 1. Eastern’s last trip to Waterford was on Sept. 30, 2016 and resulted in a 46-7 Wildcats victory. The last 22 meetings between these teams is split evenly with 11 wins apiece. 2. The Eagles last defeated the Wildcats on Oct. 3, 2014 by a 16-7 count in Washington County. That is also the last time EHS left Washington County with a victory. 3. The Wildcats have won 17 straight league games, with Belpre being the last team to defeat WHS, doing so in the 2015 finale. The back-to-back TVC Hocking champions had their nine game regular season winning streak ended last week. 4. The Eagles gave up a defensive score last Friday, with Trimble’s Max Hooper returning an interception 93 yards for a touchdown. Eastern hadn’t allowed a defensive touchdown since Week 9 of the 2016 season. 5. Eastern has lost three straight games to start the season for the first time since 2015. EHS hasn’t dropped four in a row to start a year since the 2007 season, when the Eagles finished 2-8.
https://www.mydailysentinel.com/wp-content/uploads/sites/14/2018/09/web1_9.14-MHS-Smith.jpgMeigs senior Wesley Smith (21) scrambles to recover a fumble during a Week 1 football contest against Gallia Academy at Memorial Field in Gallipolis, Ohio.